Magnificent diamonds from Harry Winston and coloured stones are set to go under the hammer at Bonhams Fine Jewellery sale in London next month (20 April 2016), along with signed jewellery by houses such as Bulgari and Cartier. Commencing at noon, the sale will feature 132 lots for auction. 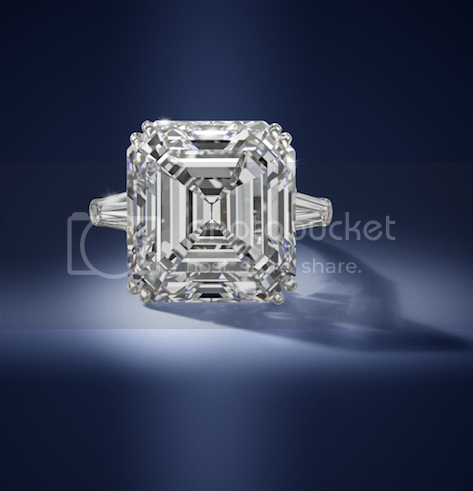 Leading the sale is a 15.52-carat diamond single-stone ring by Harry Winston, the world-renowned jeweller who famously only offered the very best diamonds. Created in 1973, the step-cut D-colour diamond boasts a VVS2 clarity grade with potential, and is estimated at £700,000-900,000. The ring is complemented by a pair of diamond earrings, also by Harry Winston, dating from 1976. Totalling 25.37 carats, the twelve D-colour marquise-cut and pear-shaped diamonds range from Internally Flawless to VS1 clarity, and are estimated at £150,000-200,000. 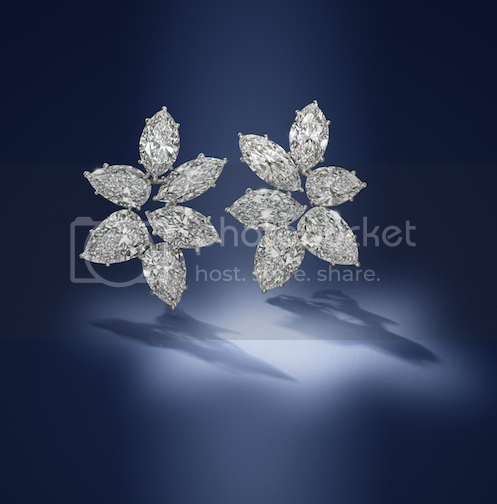 The earrings are a typical example of the Winston tradition of allowing the diamonds to guide each design, rather than their settings, thereby enhancing the individual beauty of each stone. Coloured stones are also highlights of the sale, which features a 7.13-carat Kashmir cabochon sapphire, estimated at £50,000-70,000. The unheated sapphire is set in a ring surrounded by old brilliant-cut diamonds, and boasts the coveted ‘Royal Blue’ colour, a term reserved only for sapphires of the most superior quality. Sapphires hailing from Kashmir are considered amongst the most highly-prized gems for serious collectors and investors due to their rarity, and are an exclusive class of their own. The mines were discovered in the 1880s and remained open for a period of only 30 years, yielding incredible specimens which were guarded from thieves and smugglers. Supplies were soon exhausted and political instability in the region put a stop to mining throughout much of the 20th century. 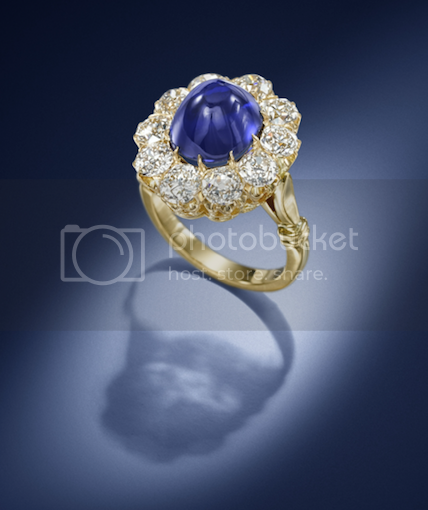 Therefore today many Kashmir sapphires are only found in antique jewellery, adding to their sense of rarity and fuelling demand. Last September, Bonhams auctioned The Hope Spinel, a 50.13-carat spinel hailing from the fabled collection of London banker Henry Philip Hope. This set a new world record for the gemstone when it sold for £962,500. In its forthcoming sale, Bonhams will offer an octagonal mixed-cut red spinel, weighing 56.06 carats. The spinel is of Tajikistani origin, with no indications of any treatment, and is described as a “magnificent rose” colour by Jean Ghika, Head of Jewellery for UK and Europe at Bonhams. This impressive spinel still retains a drill hole, a remnant from when it was likely a larger polished gem threaded onto a rope or cord in traditional manner as part of a historical Mughal collection. 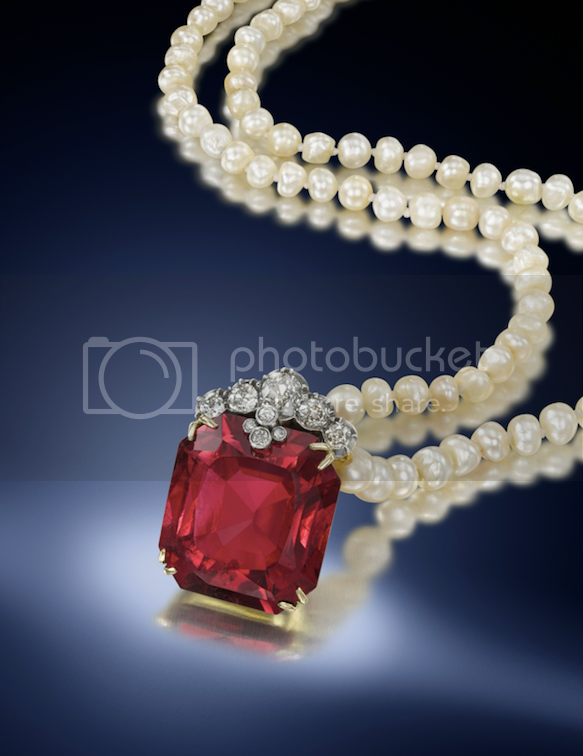 The spinel, set in an old brilliant-cut diamond surmount, on a row of graduated natural pearls, is estimated at £100,000-150,000. The sale also features a number of signed pieces, including a rare example of a diamond and ruby ‘Serpenti’ bracelet-watch, by Bulgari. Dating from circa 1965, this signature design harks back to the era of ‘La Dolce Vita’ and is regarded by collectors as the epitome of Bulgari glamour. The highly articulated gold bracelet is designed as a coiled serpent’s body and is set with marquise-cut diamond accents throughout, leading up to the diamond and ruby-set head, which opens to reveal a hidden watch. 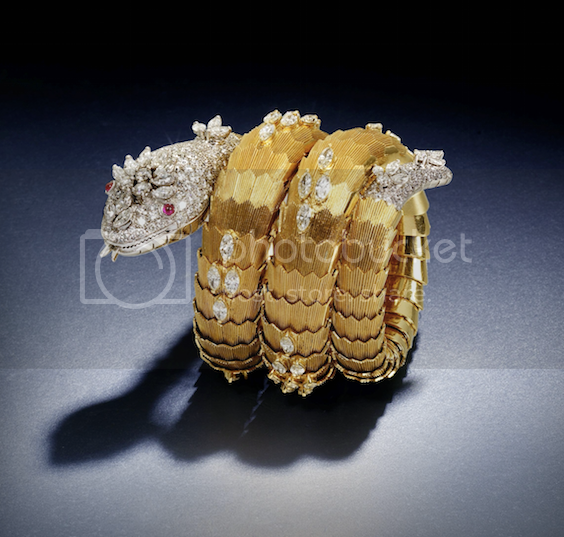 Estimated at £70,000-90,000, this is an early example of the ‘Serpenti’ designs, which were celebrated by Bulgari in 2016 with an exhibition hosted at the Museum of Rome entitled ‘Serpenti Form: Snake Through Art, Jewellery and Design’, exploring the historical use of the snake through a host of artistic mediums. Bonhams New York Fine Jewellery sale takes place on 18 April 2016. Bonhams Hong Kong Rare Jewels & Jadeite sale takes place on 18 June 2016. Bonhams Fine Jewellery is also on Instagram on @BonhamsJewels.